We’re all going crazy, buck-jumping and Breaking Bad! Wow. Just wow. 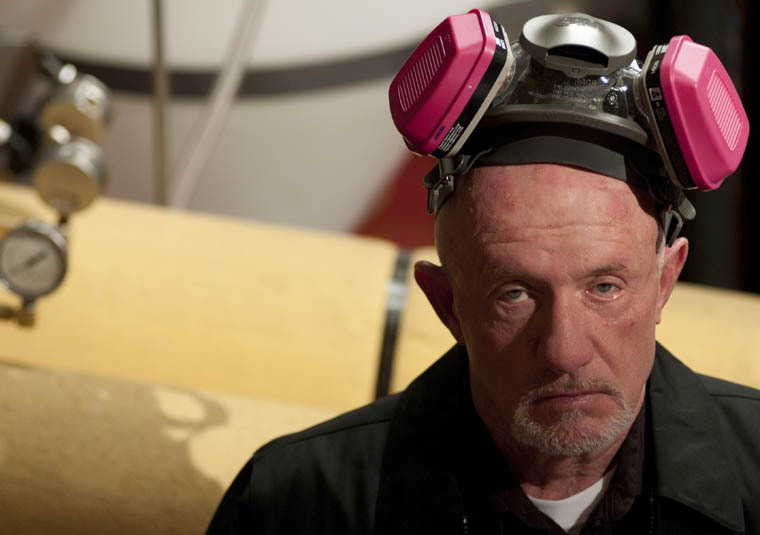 Breaking Bad season 4 (yes, as always we’re a year or so behind the US) has done the series proud. Is it better than the previous seasons? I admit, there were moments when I felt the plot was spinning its wheels somewhat – we had scenes that were variations on earlier scenes without adding anything new, usually telling us something about Walter White’s personality that we already knew – and the season didn’t always maintain its well honed balance of plot, theme and characterisation, but when it worked (and it often did), boy, did it work… and off the top of my head, and before my first coffee of the day, I could mention scenes and whole episodes that were stronger than anything that had gone before. And “Face Off”, the final episode of the season? I would put it up there with the most tension-building denouements I’ve seen or read in any medium. The way Vince Gilligan and his team have put together the individual building blocks to arrive at this ending for one of their most memorable characters, and the way it all comes together in Tio Salamanca’s muffled bell-ringing. As I’ve said: wow. At the same time, Walter White – who I once thought to be a man trying to do as best he could in an impossible situation – has become one of the greatest villains in any visual medium. 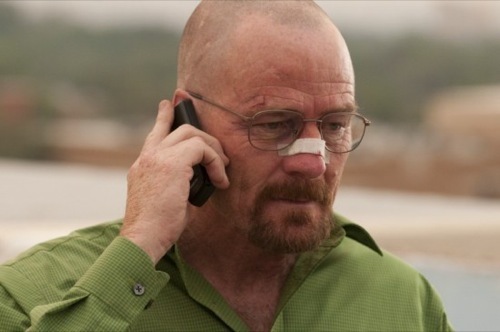 It’s difficult to read his tone of voice when he says “I won” at the end of the episode (it’s been described as smug and triumphant, but to me Walt’s shaking voice sounded not a little scared by what he’d become), but Bryan Cranston is pretty much perfect in his depiction of the character. Almost every episode of this season could serve as a master-class for budding actors, and a depressing one too – very few people will reaching the dizzying heights of Cranston’s performance and the character he has brought to life. Just coming off the high of Breaking Bad‘s penultimate season, it’s difficult to segue neatly into the other season we’ve just finished watching, namely season 1 of Treme. I started watching David Simon’s latest with unrealistic, unfair expectations: The Wire is still the best thing I’ve seen on TV in many ways, and since Treme shares some of the earlier series’ main actors (Wendell “Bunk” Pierce, Clarke “Cool Lester Smooth” Peters) it’s even more difficult to shake these expectations. During Treme‘s first 4-5 episodes I kept repeating the mantra, “It’s not The Wire, it’s not The Wire“, which is true but not entirely fair: some of the themes are the same, but Simon and his cast and crew go for a different feel here. The series is much more meandering; it has a few plots threaded throughout the series, but character always comes before plot in this series. I can’t pinpoint the moment when it all clicked – there were probably different moments for different characters – but by the end of the season, as the last episode of S1 transitioned into the flashback of all the characters preparing for Katrina, it definitely had. The writers and actors of Treme are impressively astute at balancing the depressing realities of post-Katrina New Orleans, at least for these particular characters, and the flashes of hope and humanity. I’ve never understood the people accusing Simon of cynicism (being a pessimist doesn’t make you a cynic! ), and his deep sense of empathy has never been stronger than in Treme. Except perhaps with Sonny, the Dutch louse – but given time even he could turn out to be human. Simon has a history of doing that… and I’ll gladly give him time to do so. Next Article Disappointment. The ‘D’ is silent. I´m a massive fan of Breaking Bad and The Wire too. Have seen all the Treme episodes too. It´s all about the music for me, and it makes me want to go to New Orleans, especially seeing as it was Mardi Gras today. I´ve just done a fan video tribute for Breaking Bad featuring a song I wrote called End of an Empire if you´re interested. It´s from episode 11 in the fourth season, Crawl Space. One of the craziest scenes in that season, although there were many. http://youtu.be/ACmYgGyPXcs I´ve also posted about a couple of Treme songs in my song of the week blog, and I´ll get around to writing about a couple of gems from Breaking Bad sooner than later too. Thanks for your comment! I’ll definitely make sure to check out your blog too, Padraig – it’s a cool idea to look at songs in TV series.